Welcome to MQ Technologies ! Hope you will find them helpful. Remote Executer is used to execute a command line on the client machine from a remote session on the Citrix or Remote Desktop Server. Using this utility, user can launch any program with parameters on the client side. The program can be also configured to redirect http (https, ftp, ftps) link from server to open on the local machine. Open a document file (PDF, Word, Excel, etc) with default associated program on the local/client machine (file must be accessible from local machine). 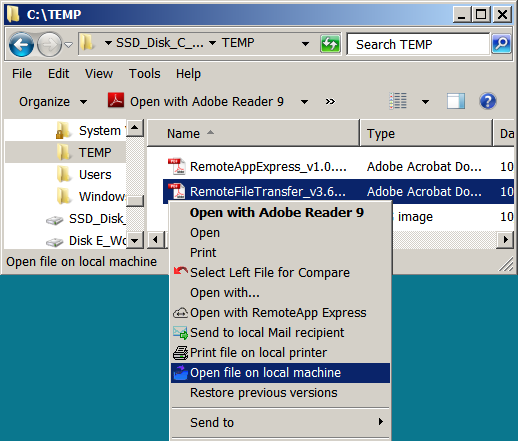 If file is on the server, check other program Remote File Transfer. Download the document for more detail. Notes: for Citrix, the FREEWARE version of Remote Executer works only with Windows 2008/R2 and previous versions. A commercial version with no limit is available. Send an email to request a demo version. Print a file on the default printer installed on local machine. This program can be also configured to provide Content Redirection feature like with Citrix XenApp for any type of file. For example, from an Outlook email, when double clicking on an MS Word or PDF attached file, the file will be transferred to local machine and opened with the default associated program. Notes: for Citrix, the FREEWARE version of Remote File Transfer works only with Windows 2008/R2 and previous versions. A commercial version with no limit is available. Send an email to request a demo version. 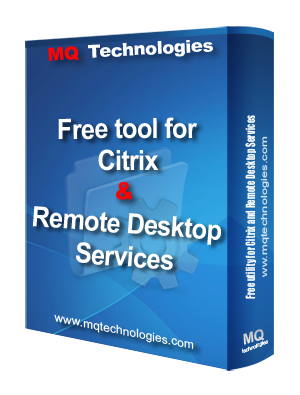 Remote Desktop Mailto for Remote Desktop Services (Terminal Server) and CITRIX is a utility program that can handle mailto command on the server and create a new Microsoft Outlook email on the client machine from a remote session on the Terminal Server / Citrix. This program can especially create email with file attachment, which was not possible with mailto command in almost other email client programs. RDMailto version 1.0 can only attach file on the local machine to new email. File must exist on the local machine. This version works well on Windows 2008 R2 (recommended) and previous versions. Virtual Channel COM Service Framework for Remote Desktop Services (Terminal Server) / Citrix solution is a set of drivers and components that provide the communication service between applications on the server and COM objects on the client side. In the real world, applications running on the Terminal Server / Citrix usually need to make call to the client machine to perform special tasks as controlling specific devices (ticket printer, cash drawer, MSR, MICR, Electronic Signature Pads - all Topaz models, etc) or launching / connecting-to an application instance on the client machine (Active X programs as Word, Excel, Outlook, etc). Currently, there is no solution for this specific need. Application developers for Citrix / Terminal Services solutions usually have to spent a lot of time to do research on a portable solution for this problem. Virtual Channel COM Service Framework is designed to provide application developers an easy, efficient, portable and flexible way to archive the most tedious tasks of communication between the server and the client machine. Application developers do not need to know how the function call is forwarded to the client side, and how the result is received and if an error occurs, all information is sent back to the caller as in a normal program. Virtual Channel COM Service Framework provides VB developers the quickest way to do their work as they usually do with Visual Basic in the world of COM based development. For C++ developer (or other programming language supporting COM as Delphi, PowerBuilder and .NET), the framework provides a COM based standard set of methods for normal uses. This framework has been tested and used with Visual Basic, Visual C++, PowerBuilder, Delphi and .NET. Virtual Channel COM Service Framework is available for both 32-bit and 64-bit Windows. A special version of Virtual Channel COM Service Framework supports VMware PCoIP protocol using in VMware Horizon View. 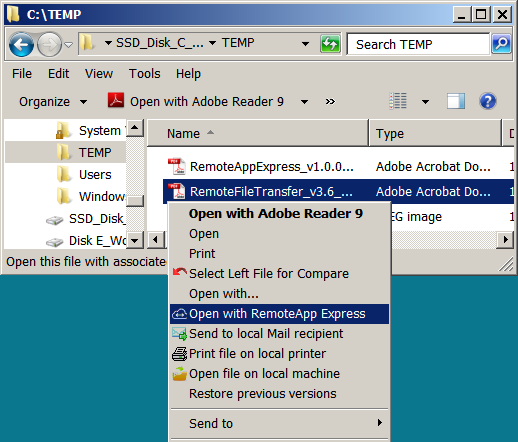 Double click on a file and the file will be opened with default associated program on RDSH server via RemoteApp Express program. * Only specific file type allowed by Administrator configured on the server can be opened for preventing security issue. Only document file type (no executable file type) can be opened. This program, in any kind, is not for competing with the new product Citrix XenApp Express announced by Microsoft, which will replace Microsoft Azure RemoteApp in 2017. It's only an enhancement, an easier way (express) of use of Microsoft RemoteApp on RDSH Server. Version 1.6 released on Jan 19, 2019. Version 1.0 released on Oct 15, 2016. Remote Application Center is a simple program that permits controlling access to applications installed on Terminal Server. Applications are published on the server and user can run it directly from shortcut on the client side. Compatible with Windows 2000/2003 and Windows 2008 with Remote Desktop Services. © 2019 MQ Technologies Inc.